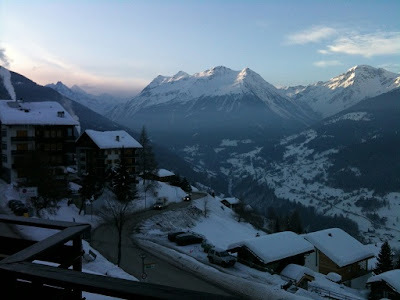 Last weekend Stobby and I were in the Valais on a work-related ski trip with the husband. The Valais is the region of Switzerland that has the Swiss Alps and is visually spectacular, summer and winter. The more I read, the better I write. I also tend to write and talk out loud at the same time which my husband's coworkers might find a bit freaky. And instead of diving into a world that I create, I wanted to pass the weekend in the world I live in. It was rather trippy reading about sticky, smoggy Bombay while looking at jagged, bitterly cold mountain glaciers. I also went snowshoeing and did a little tour of the small town, St. Luc. One road, one post office, a church and one bar (so that you always know where your kids are), it's the perfect vacation destination for Jason Voorhees. The most interesting part of the town could be found in the grocery store. With the usual staples this store, 1600 metres above sea level, also sold truffles, 50 different cheeses and a wide variety of fortified liquor. After smelling the regionally made Apricotine, I had to buy it. The Apricotine is a strong liqueur made from apricots. The bottle is small enough to fit into the pocket and comes with a drinking cap. I'm not really a hard liqueur kind of gal. Hurts the stomach. It was the soft scented apricots that made me decide that if I ever become a successful author, you know the womanizing, alcoholic, tormented soul we all dream of being, Apricotine will be my beverage of choice. Until then, coffee is the number one drug in my home. Apricotine comes from Martigny. Stobby suspects Martigny has good coffee machines as well.